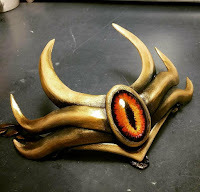 Gemstones are an important part od costume and jewellery making and during my cosplay making, I perfected my art of making gemstones with the help of different internet tutorials and tips and tricks I found out myself! So come and take a look how I make those gemstones and what you gonna need to make them. Depending on the shape that you want to achieve you have to either buy or cast the main "glassy" part. In mineral, beading and jewellery making jargon, you can find those glassy part under the term cabochon - Cabochon is a shape of a cut stone/glass/bead, that is flat from the bottom side and round from the upper, so it perfectly sits in a bezel and the flat side ensures better fit on a human body. Easiest way is buying them and you can find cabochons in different sizes and shapes on ebay, Aliexpress or in some bead-shops. 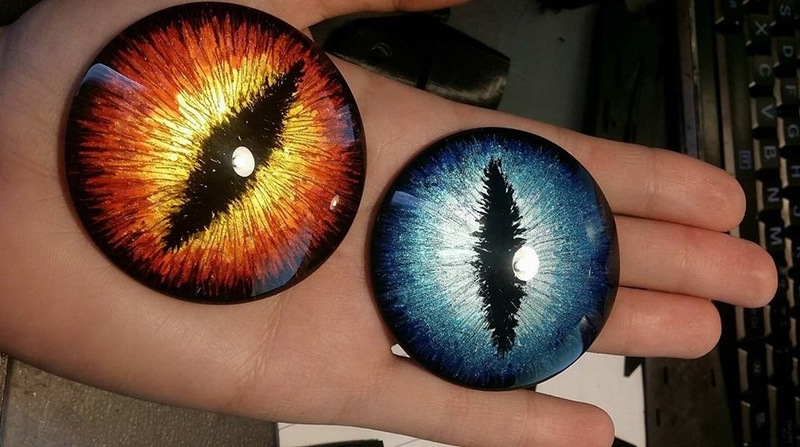 Advantages are, that you get only glass cabochon and glass can withstand a lot of stress and is perfectly translucent. Disadvantages: There are only limited sizes and shapes you can buy and it takes long to arrive. If there is no desired shape available for the build you have, you can make a mold and cast the gem with crystal resin. 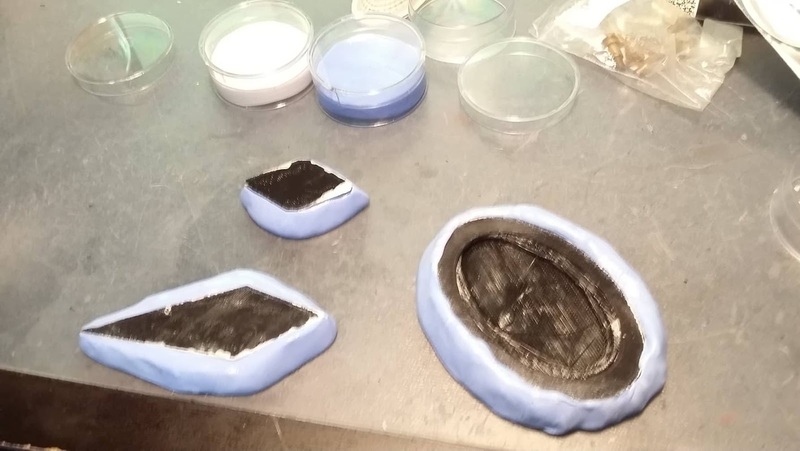 Casting is time consuming and silicone+resin aren't the cheapest materials, but sometimes you have no other choice. 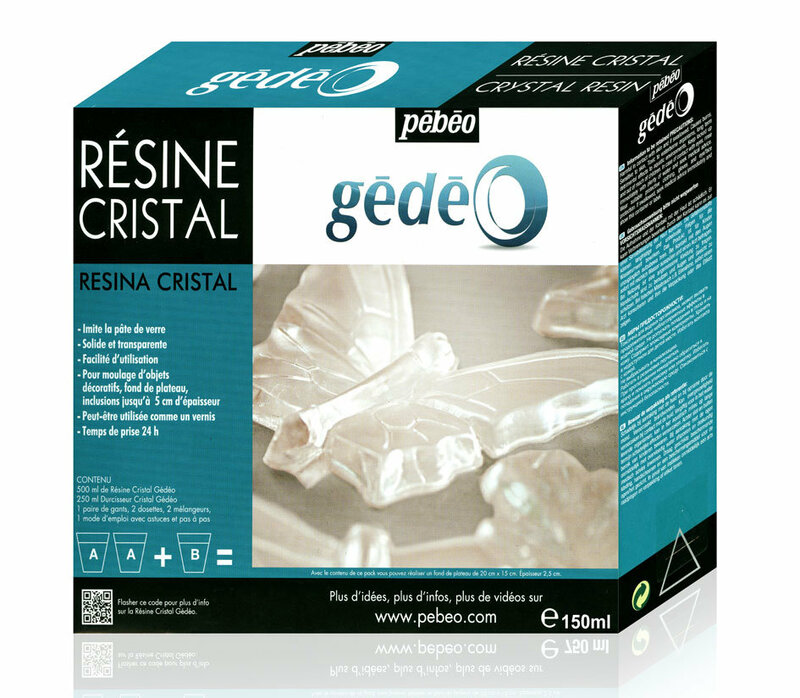 For starters, I can recommend these more expensive, but widely available materials: Crystal resin and mold making paste by Gedeo. There are also several similar materials available on ebay - check this. There a lot of other more professional materials available, but this will be enough for start, I'm testing better materials myself right now. 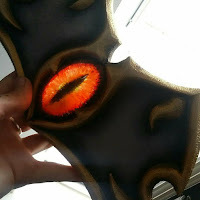 First you have to make a desired shape from some other material - I modelled mine in computer and printed it on my 3D printer and sanded well to make my gemstones, but I think the best alternative is to make it from a polymer clay - be sure to sand the polymer clay down after baking too, so your gemstone has a perfectly smooth finish. Then mix the siligum components and press the clay gemstone into it and leave for 5+ minutes. Be sure to work fast - the siligum gets hard very very fast. 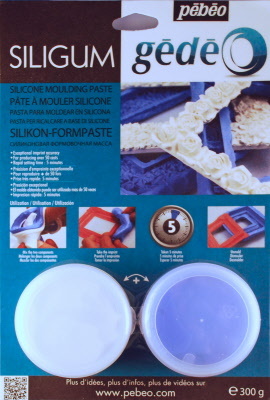 Then take your gem out of the siligum and you have a finished mold - you can mix the crystal resin components and pour it in your mold. Be sure to mix it accordingly - lot of resins have different mix ratio and if mixed poorly or in bad ratio, the resin won't harden. Wait 24h (depending on resin type), take your gemstone outta the mold and you're done! If the surface of the gemstone isn't perfect, sand it down with sandpaper -start with rougher and continue to smoother and as a final touch spray with clear varnish. If you have your cabochons prepared, we can start coloring them! You just need a wide variety of nail polish and glitter. And if you have some experience with nail care, it will be perfect for this. 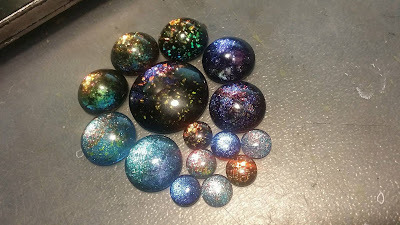 If you want to create very shiny cabochons with magical effects, you'll need a lot of glitter, holographic/chameleon glitter at best, transparent nail polish and dark black nail polish. As last layer, use other color of nail polish according what you need for your cosplay. Keep in mind, that most glitter looks best on dark background (black). On the picture, you see glitter on black nail polish and only 2 medium cabochons have blue background nail polish. You can also combine a lot of other stuff - different patterns, different nail polish colors and different glitters, but in my experience, bigger glitterflakes make much better look than smaller particles. I buy my glitter on ebay too searching "holographic/chameleon nail glitter" - check this. ...or any other eye you decide to do! As with magic cabochons, you'll just apply nail polish on the flat side of the cabochon. Start with black nail polish - I recommend using some nontranslucent black with very thin pointy brush. 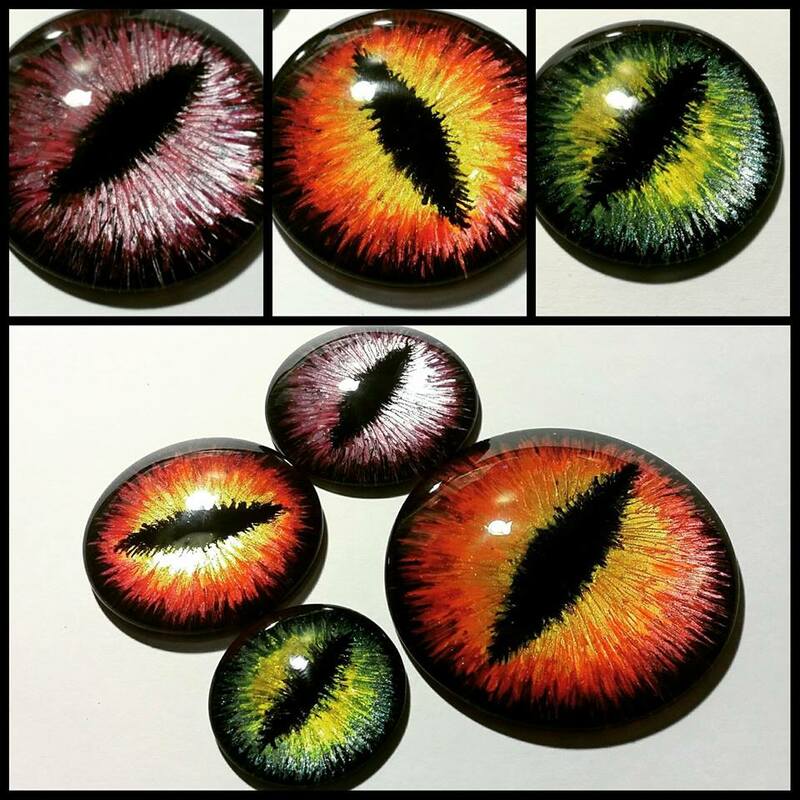 Make the pupil in the middle - having a checkered paper under the eye will help you make the pupil in the exact middle. make the pupil very "hairy" - it doesn't need to be even - help yourself with a bodkin to spread the nail polish to your liking. Then I make a hairy border around the whole eye with the black nail polish. I let it dry and then I start with the darkest color in the border, adding lighter and ligher color asi I go in the middle. I mix the colors together with bodkin asi I go - always making movements that are radial - from the middle to borders. Watch me working on it in my video below, or see a tutorial, where I've learned this technique here. This is the eye I made in the video up there! you can use LED's to lighten the cabs up! Wow that's amazing bro! thanks for the tutorial! Love that! 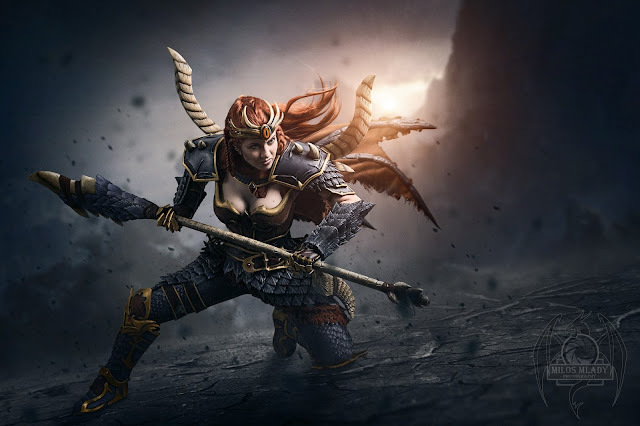 please visit me back at https://games268.com/game-pc-android-viral-terbaik-2019/ Thanks!